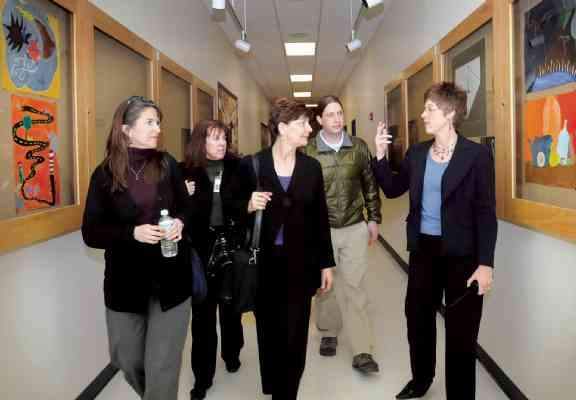 Leanne Garcia, right, with Durango High School, and Kathleen Morris, second from left, give a tour of the school to Diane Ballard, left, Linda Kanan, center, and Dan Haught on Jan. 21 for the district’s new safety program. Morris is 9-R’s safety compliance coordinator. Durango School District 9-R is launching a program with state officials to improve safety in local schools. District 9-R was chosen as one of three sites for a pilot program run jointly by the Colorado School Safety Resource Center and the Center for the Study & Prevention of Violence at the University of Colorado at Boulder. Linda Kanan, director of the state center, and Diane Ballard, project manager of the university center, visited Durango last week to meet with 9-R officials. They toured Durango High School, which was selected for the program "based on assessment of need," said Kathleen Morris, 9-R safety compliance coordinator. Kanan said the state could offer technical assistance and training to improve school safety. DHS reported 22 incidents of drug abuse, nine incidents of alcohol abuse, 33 incidents of tobacco abuse, three fights and eight incidents of wea-pons possession during the 2007-08 school year, according to the Colorado Department of Education. DHS reported no felony assaults. Ballard said she wants DHS students to take a survey before the school year is out. The anonymous survey would help researchers establish a baseline for further study, Ballard said. Kanan asked several questions about DHS' student population, delving into poverty, bullying, ethnic makeup and other questions. Assistant Principal Leanne Garcia said bullying at the high school is most prevalent among ninth- and 10th-grade girls. "That's where our bullying occurs," she said. Ballard said she is seeing an increase of "cyber-bullying" among students. The state program is taking a long view, Kanan said. "We're quite aware that you may not see a big change one year down the road, but we're in it for the long haul," she told Morris and Garcia. Kanan and Ballard also expressed eagerness to construct a detailed map of the high school for emergency responders. Morris said 9-R would be committed to working with the Durango Police Department and Durango Fire & Rescue Authority to improve the mapping that is made available to them.